The slider, sometimes known as a carousel, allows you to create scrolling sections on your page. The Slider Element is a super powerful tool for creating scrolling sections of content on your pages. Each slide of the Slider Element is it's own dropzone, meaning that you can customise it how you like! To get started with the Slider Element, simply drag one onto your page. You will immediately notice that you can go on to insert other elements right into the Slider Element. To insert elements into your Slider Element, simply go ahead and drag them into the slide that you would like. You can customise the amount of slides in your Slider Element depending on your needs. You can allow your Slider Element to automatically change every few seconds when your visitor is on your page. Simply toggle the Auto slide option in the right-hand menu. 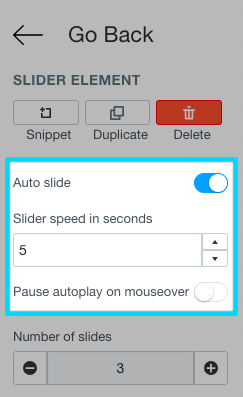 You can even set the amount of seconds that the Slider Element will change the slides at. There are a few options that are available for customising your Slider Element. You can choose whether or not to show the arrows on the left and the right of Shogun. You can simply toggle this in the right-hand menu of the editor. You can also choose to show the dots at the bottom of the Slider Element or not. 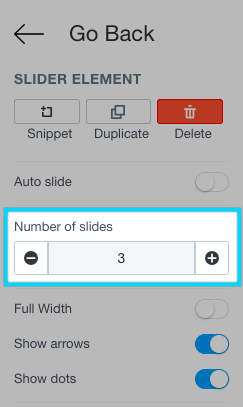 This allows your visitor to see how many slides are in the Slider and also allows them to navigate between slides.